Punks for Peace, a local Sacramento youth activist organization, is putting on a meeting supporting #Right2Rest on February 17th at Southside Park (2115 6th St) starting at 6:30 PM. 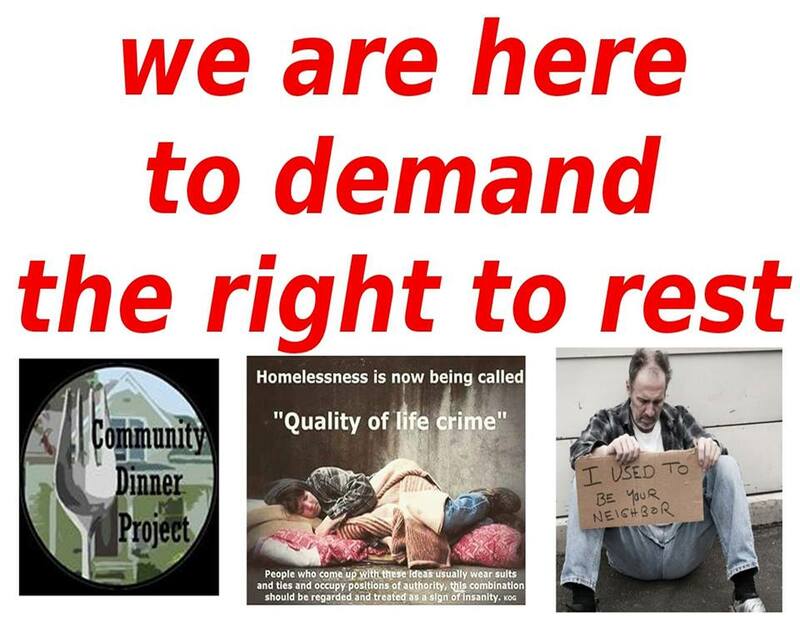 #Right2Rest is an operation organized in support of more rights for the homeless. Punks for Peace is a fantastic group of kids (and some adults, even! ), who are worth witnessing even if you don’t support their views. Learn more and find information here. Phono Select shows are finally back, and with some great bands, too! 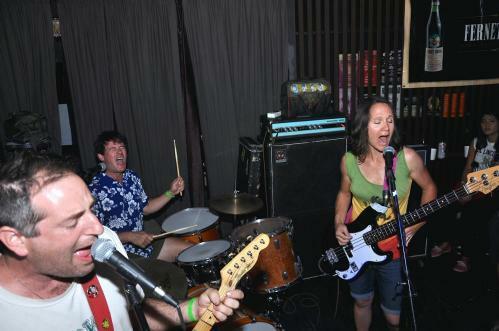 On Thursday, February 18th, at 7 PM, The Bananas are playing at Phono Select (4370 24th St, Unit O). Also playing are Expert Alterations and Blhans. Stop by and say hi to our pal Dal! All ages. More info here. 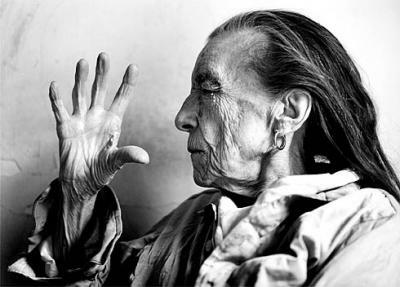 On February 18th at 7 PM, Verge Center for the Arts (625 S St) is holding their annual Movie Night, with a showing of Louise Bourgeois: The Spider, The Mistress, and The Tangerine. The film will be shown in association with Verge’s current exhibition, do it. A feature of Bourgeois’ work will also be featured in do it. Free popcorn and cheap drinks, $5 for adults and $3 for students. More here. The Colony is a frequent for TUBE and other rock n roll lovers, and with good reason, this show being one of them. 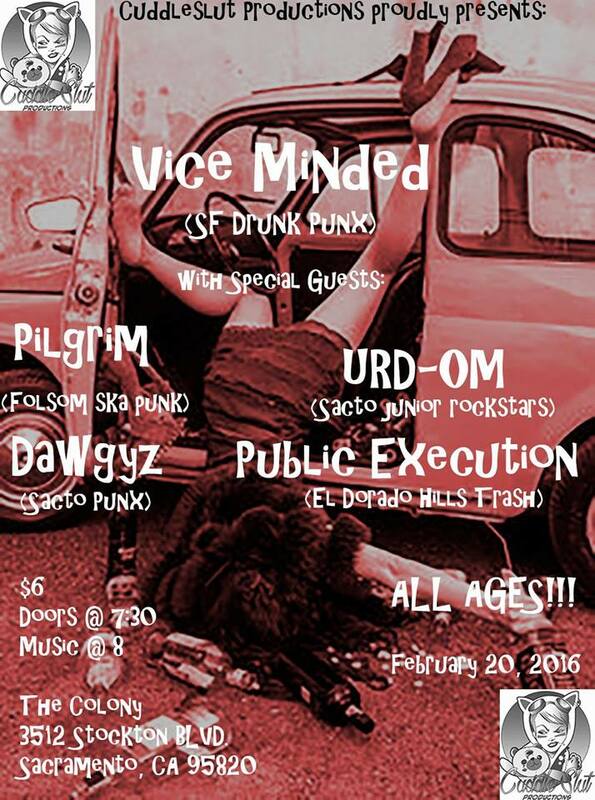 On February 20, from 7:30-11:30 PM at The Colony (3512 Stockton Blvd), Cuddleslut Productions presents Vice Minded , URD-OM, Public Execution , Dawgyz, and Pilgrim. Cover is $6. More here. On February 22nd, at 7 PM, The Colony (3512 Stockton Blvd) is hosting a killer show to support the touring bands. 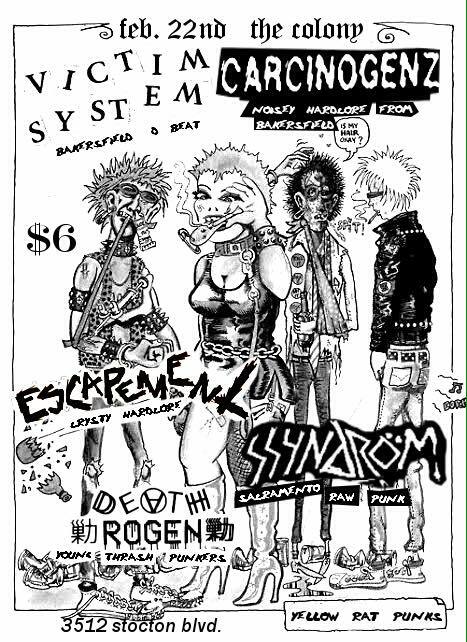 Come support Escapement, SsyNdroM, Victim System, Carcinogenz, and Death Rogen. With amazing stage presence, grinding vocals, and some of the nastiest guitar around, these bands are not ones you should miss. Cover is $6. More info here. Tags: #Right2Rest, Blhans, Carcinogenz, Cuddleslut Productions, Dal Basi, Dawgyz, Death Rogen, Do It, Escapement, Expert Alterations, homeless, Louise Bourgeois, Louise Bourgeois: The Spider The Mistress and The Tangerine, movie night, phono select, Pilgrim, Public Execution, Punks for Peace, Sacramento, Southside Park, SSyndröm, The Bananas, The Colony, the list, tube magazine, URD-OM, Verge Center for the Arts, Vi Mayugba, Vice Minded, Victim System. Bookmark the permalink.